The first blog is on the Site Map. My second Christmas in this house was absolutely wonderful! 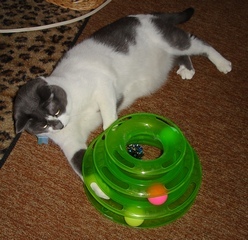 Bobbi gave me this neat new toy, which has three tiers with balls inside each one. Every time I play with it, I get so tired chasing the balls and running around the circle to see where they've gone, that I then have to take a nap. 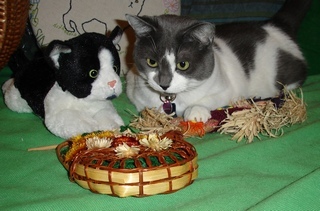 I was supposed to be a "domestic shorthair," but my grey and white fur is actually a bit longer than Bobbi expected. Humans who meet me almost always comment on how soft my fur it (thank you for the compliments!) and I work hard to keep it pristine. That requires some help from various brushes, which Bobbi faithfully employs every weekend. It's become a Sunday night ritual, which I love so much I've been known to find the long thin brush I like best and knock it on thte floor to remind her! Last year, a close friend gave Bobbi a wonderful book for her birthday. Sylvia Adams, whose cat, Tulip, is a member of our MEWSical Society (and whose two kittens have joined the Fan Club), presented Bobbi with Crafting with Cat Hair. So I've watched closely how she combs the hair out of the brushes and collects it in a plastic bag. There's quite a lot, and it's primarily grey, so I expect her to figure out how to make something lovely this winter. The book shows how to make a hat for your cat, but I don't like to wear hats, so I hope she makes a pin to wear when she goes out, so she can take me with her! When the first Simon Teakettle became famous from his comments sent to CBC Radio programs, he began to receive cards and gifts from fans. One fan was a neighbor of Arthur Black, whose Saturday afternoon program, Basic Black, had a huge and faithful audience. Bobbi stayed in touch with Art, although they never met, and you can see a few of his books promoted on this website, at http://SimonTeakettle.com/humor.htm. 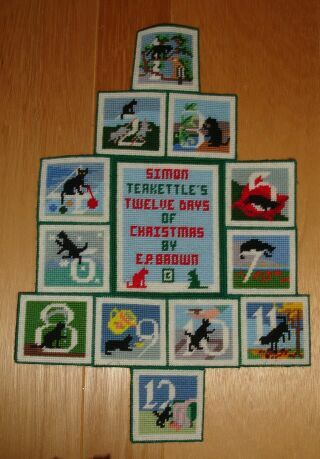 and created a wonderful wall hanging in needlepoint, which hangs in our office. Here it is, on the left, along with a pillow she embroidered, above, which I love to cuddle up against. I'm getting excited about Christmas. There's a silver basket in the living room under the coffee table, where Bobbi puts Christmas cards as they arrive, and a big red stocking with lots of ribbons is on top. I think it's for me, but know I'm not supposed to explore it yet. I have touched the ribbons (very carefully!) but not when Bobbi's watching! Bobbi is very strict about my not touching things until she gives me permission. I finally figured out that it's okay to take toys out of the baskets in the den, after she pointed out that they belong to me. I love to be petted and called "Good Girl," so I don't want to get into trouble! I did watch her put a tiny present into the stocking when she came home Tuesday night, and then another wrapped gift beside the silver basket. She told me they were from Auntie June, who always gives us terrific surprises. Meanwhile, I'm helping her with Christmas cards. A few get delivered in person, but most of our friends receive a special holiday poster sent via email. This year, because Hannukah begins on Christmas Eve, and the The Prophet Muhammed's birthday is also this month, we're wishing everyone Season's Greetings. We just renewed my license with the City of Gatineau, which means I'll be receiving a new tag in a new color. 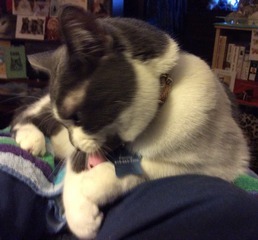 The 2016 tag was light purple, which matches my special dressy collar Bobbi bought for me for Hallowe'en. It has tiny spiders, which are barely noticeable, so I think I can wear it at any time of year. Do you agree? You probably can't see in this photo, but I have a weekly pawdicure, where Bobbi clips the sharp edges from my claws. I know she's going to do this when she does her own nails, and have even requested that she use the emery board on my claws as well! She also cleans my ears and brushes my teeth, and, of course, uses a variety of brushes on my silky fur. We're approaching my second Christmas living in this wonderful house with Bobbi. It's so much fun to sit in the front windows and see the lights not just on our house and porch, but the colored lights along the roof of the house across the street. They added an extra circle of lights around the tree on their front lawn this year as well. We had our first snow last week, and I had to check the windows in the back as well as in the front, to make sure it was falling in both places. It's one of those things I don't understand, although I'm doing my best to learn as much as I can by listening to the TV, and to conversations Bobbi has with people who visit us. I'm more sociable than any of the cats who lived in this house before me. When we have visitors, I not only come out to greet them, but usually sit on the rug in the living room as they chat. One recent visitor was surprised that I don't fall asleep while people are here, but Bobbi pointed out that I enjoy listening to human voices. Recent research reveals that dogs, cats, and many other animals understand more language that humans realize. So be careful what you say about us! Canada has just named the gray jay, or whiskey jack, as its National Bird. It was a surprise to many, who felt the loon or the Canada goose were more likely choices. But the experts who made the final decision pointed out that the gray jay is found all across Canada, doesn't go south in the winter, is friendly to humans, and is very smart. It's a distinct species (as is the bluejay), but both are members of the crow family, the most clever of all birds. Read about crows on the Animal Facts page, and expect our pal, Steve Pitt, to send us a photo for the Fan Club very soon, as he's certain to have gray jays around his property in Rutherglen, Ontario. subspecies of the Asian raccoon dog. Known as the tanuki, the animal has been significant in Japanese folklore since ancient times. The legendary tanuki is reputed to be mischievous and jolly, a master of disguise and shapeshifting, including the ability to transform into a teakettle! Now that's a clear indication that it belongs in Simon Teakettle's Fan Club. Our aim is to reach 100 species from 40 countries in 2017. November is Pet Awareness Month, Adopt a Senior Pet Month, and National Senior Pet Month. In addition, Nov. 6-12 is National Animal Shelter Appreciation Week. The reason for all these special occasions is to remind the public about the plight of animals who are either living outdoors as winter approaches, or waiting in shelter for adoption. Many people go to shelters looking for kittens or puppies, but older animals need homes, too, and can be excellent choices for busy families or older singles who don't want the hassle of training a puppy or kitten. 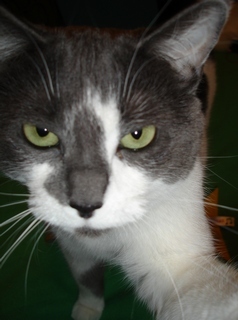 At just a year old, I was not only litter-box trained and socialized, but had just been spayed and had all my shots. Still technically a kitten, I didn't pose any of the problems often seen in younger kittens: climbing drapes, jumping onto counters or tables, scratching furniture, or racing out of open doors. My exceptional manners (which everybody notices!) are a result of Bobbi's careful training (see the top right of this page for a link to her article) as well as my realization that following her instructions would make me very happy. Shelter cats are wise. We know we were in peril and are grateful to have been rescued. We repay our humans by coming when we're called, obeying their rules, and lavishing them with affection. This is National Cat Day, but before we leave October behind, we have to mention that this month was also Squirrel Awareness Month. 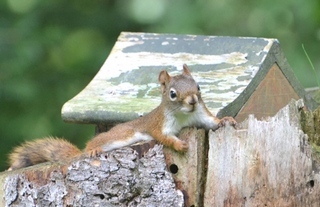 On the Fan Club page we featured this squirrel who took over a bird house on the Pitt property this fall, and Steve also sent us a chipmunk with his cheeks full of acorns, sharing the lawn with a bluejay. I have a red squirrel friend who visits us every day, sitting on the ledge outside the office window and then feeding on the seeds that fall from the bird feeder onto the ground. 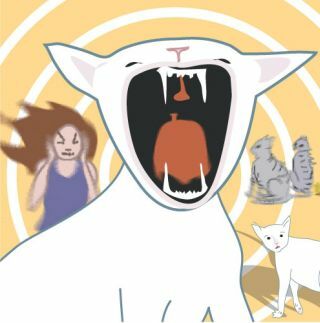 This past week was National Feral Cat Week, which is more important than ever this year because there seems to be a concentrated effort to wipe out feral cats. Alley Cat Allies is just one of the organizations we support who work with shelters and the public to protect cats from harm while trying to limit the proliferation of feral cats by encouraging Trap/Neuter/Return programs. As a cat who lived outdoors for the first six months of my life, I know how important it is not to let cats breed indiscriminately, and to support shelters who place cats for adoption. I love living indoors, and feel sorry for all the feral cats who don't have humans to cuddle and feed them, play with them and care for them as Bobbi does. Did I mention before that not only does she brush me, but I let her clip my claws, clean my ears, and brush my teeth! Indoor cats (who have also been spayed or neutered) can live a very long time. 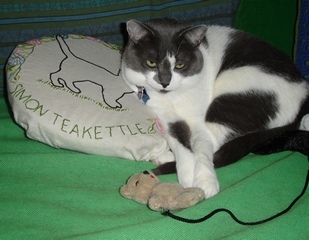 Sammy Teakettle (who was named after the second Simon) was close to 20 when he died last month. Simon II (Tiki) was 19 when he died. He had been a feral, too. Bring Your Teddy Bear to Work Day was October 12. I didn't bother to mention it earlier because I bring my teddy bear to work Every Day! This particular day is the 90th anniversary of Winnie the Pooh. October has lots of other special days, and the entire month is Black Cat Month. That's important to us because the original Simon Teakettle was completely black, with not a single white hair! Then, Simon II (Tiki) had a tiny white locket, and it began to go downhill from there. Terzo was black with white, and I'm primarily white, with what might have been black patches diluted to grey. But the Black Cat Spirit lives on at Simon Teakettle Ink! This is Universal Music Day, and a company called Universal Music has just released an album of music just for cats. Bobbi and I listen to music all the time, including at bedtime, when Bobbi turns on the music on the night table. Research has revealed that cats begin to understand music after they're born, from sounds they hear, like birds chirping, their mother's purring, or the sounds of siblings sucking milk. Cellist David Tele, a music professor at the University of Maryland, has used the sound of notes playing rapidly (23 per second) because that's the frequency of a cat's purr, to create an album just for cats. He plays his cello accompanied by the U.S. National Symphony Orchestra. I'm hoping somebody finds this record and sends it to me for Christmas. I need to add to last week's discussion about sleeping places, because now that it's turned colder, I've been climbing onto the heated waterbed with Bobbi when she goes to bed. The nice thing about fall is that I can sit in the windows facing the back yard and watch the leaves fall from our huge maple tree. Bobbi has taken a few fall photos of me to put on the latest poster she delivered to GCTC. Here are a couple of decorations that are now in the carport. She let me inspect them first. 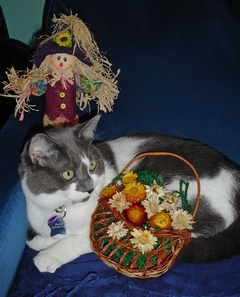 I didn't think the scarecrow was very scary, and was puzzled by the basket. Tazi wanted to take a look as well. I'm hiding the scarecrow from him, because I didn't want him to be frightened. Cats spend a lot of time sleeping. Most of us have several spots around the house where we like to curl up for a nap. So I don't quite understand the need for elaborate and expensive designer cat bed. Bobbi told me about a website that sells cat "houses" shaped like a tepee, the White House, the Kremlin, the Eifell Tower and even the Taj Mahal. I'm glad she didn't waste her money on one of these. Like the three Simon Teakettle's who lived in this house before me, I have a variety of sleeping spots that I selected myself. Terzo and Tiki sometimes slept on the bed during the day, but I only join Bobbi on the bed early in the morning. My number one napping location is the guest room bed, which I've taken over as My Own. 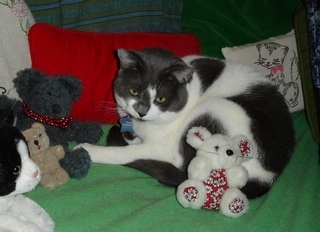 You'll see many photos on My Page where I'm on that green bedspread with Tazi (the pal I inherited from Terzo), the Simon Teakettle pillow made for Tiki by a CBC radio fan, and other toys and props Bobbi gathers for photo sessions. I also like to sleep on the living couches. There are two, and I curl up on one or the other, depending on my mood, and where the sun is. Speaking of sun, I sometimes doze off on the carpeted shelf in the dining room window, or on my carpeted shelf in the office window. But those are only for tiny catnaps, as windows are for observing squirrels in the back yard or birds at the office feeder. Our Fan Club continues to grow, and we may actually reach 100 species by the end of the year! We've just added an owl, a gecko, and a hedgehog, and last week we received photos of a fox, a skunk, an opposum, and a porcupine! Thanks to June Coxon for several of these. 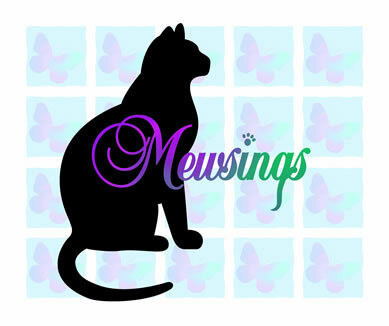 June is an affiliate of our MEWSical Society, and one of the friends who sells copies of MEWSings/Musings for us. The newest country to be added is Scotland, but we have friends who are traveling to Peru this fall, and are eager to see what they photograph there. Drum & Marlene Hudson are friends from Orpheus who sent us all those fabulous Fan Club members last winter from their trip to Australia and New Zealand. Bobbi bought me a pretty purple necklace/scarf thing which she thinks I might wear as a Hallowe'en costume. It's decorated with tiny sparkling spiders, which don't show up in the photo, but which really captured my attention. I do love sparkly things! My favorite balls are not the plastic ones with bells inside, although I do play with those, and I also like the very small soft ones I can pick up in my teeth and carry around. But my favorites by far are the sparkly, crinkly ones. I know I don't look happy posing in this costume. 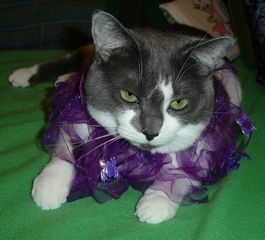 It's not that I don't like it, it's that Bobbi interrupted my nap to have me try it on so she could take pictures. The Catalyst Council has declared September Happy Cat Month. As you can see on my page, I'm a very happy kitty. I show Bobbi every day how much I appreciate being taken out of a small cage at the Aylmer SPCA and brought to this Wonderful House, where I have carpeted shelves in three different windows where I can watch Birds, Squirrels, and the Kids in the neighborhood. I also have several great Napping Spots, and plenty of food and water. I have a fountain I haven't decided to use yet, but Bobbi keeps reminding me about it, and keeps it full. I do like the sound! Summer is almost over, and I just realized I forgot to make sure my lobster pal has managed not to be mistaken for somebody's dinner. Here I am, reassuring her. 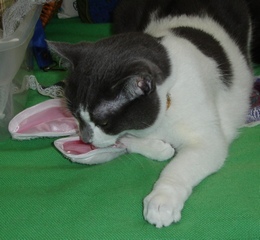 And on the right, I'm kissing my pink mouse. We keep reading about all the animals whose intelligence has been underestimated. Dogs, it's been revealed, can read human emotions. So can horses. Ravens seem to be able to guess at the thoughts of other ravens, which used to be considered a uniquely human ability. Elephants are among several animals who remember people they met a long time ago. You can read many facts about animal characteristics and behavior on our Animal Facts page. There's a separate page for Cat Facts. But I can tell you that I'm the fourth Teakettle in this household who has learned to figure out what Bobbi is thinking. Humans are actually really predictable. 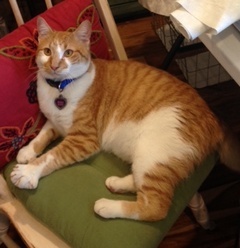 The first Simon Teakettle wrote a article about human behavior which was published in CATS Magazine, and later included in the award-winning book Simon II (Tiki) and Bobbi co-authored. You can read "Grow Your Own Fur Coat" in Mewsings/Musings. Did you hear about Brigit, a 6-year-old Tonkinese cat in New Zealand, who steals underwear and sox? She has delivers these items to her owner, Sarah Nathan, usually leaving one sock at the front door, and the other one at the back door. I want to go on the record as stating that I never steal things! Like Terzo, I do hide toys, opening the sliding closet doors as he did. He hid mice, while I tend to hide my favorite crinkly balls. But Mysti, the tortoiseshell part-Persian Bobbi adopted when she was teaching at The Latin School of Chicago, liked to steal red pencils. Bobbi kept a supply of these in a mug on her desk, and realized they were gradually disappearing. Only when she had a friend move the piano and other furniture lining the walls was it clear that Mysti would carefully remove a single pencil, play with it, and then lose it when it ended up along the baseboard. As TV is dominated by the Olympics in Rio this week, we discovered that there's a Kitty Olympics being shown on the Hallmark Channel as counter-programming! The Kitten Summer Games, a spoof of the 2016 Rio Olympics, promotes animal adoption and shelter awareness. Proposed events include Boxing (kittens in boxes), Fencing (kittens climbing fences) and Curling (since kittens love to curl up). Other kitty news is that there are now three resident cats at Westminister in England. The Treasury has got its own cat, called Gladstone, who is the third official mouser in Whitehall, after Larry in Downing Street and Palmerston in the Foreign Office. Like his fellow Westminster felines, Gladstone is a former stray whos been recruited to catch the mice overrunning the department. Three of the four kids from across the street visited today. It was such fun to have the girls to play with, and they're really good at fishing out balls and little mice that have ended up under low furniture or behind doors. So I have a bunch of "new" toys to play with this weekend! Cats who live alone with someone who is goes out to work every day might need a companion. I just heard about Companion Pets, sold by Hasbro. They need 4 C batteries, and have a mute button, in case the human gets tired of listening to meows! One of these new toys includes a long-haired cat featuring soft fur, soothing purrs and pleasant meows. It responds to petting and hugging, via built-in sensors which respond to motion and touch. Guess that might be a solution not only for lonely kitties, but also for those unfortunate humans who can't have a real cat because of allergies. Yes, I miss Bobbi when she goes out, but she doesn't leave me alone every day, and never for more than a few hours. (Well, only occasionally). When she's gone, I sometimes cuddle with one of my stuffed toys, and she always leaves the radio on for me to listen to. We've been blogging a lot about Training, but for me, the Gold Standard has been set by the Chicago-based Acro-Cats. 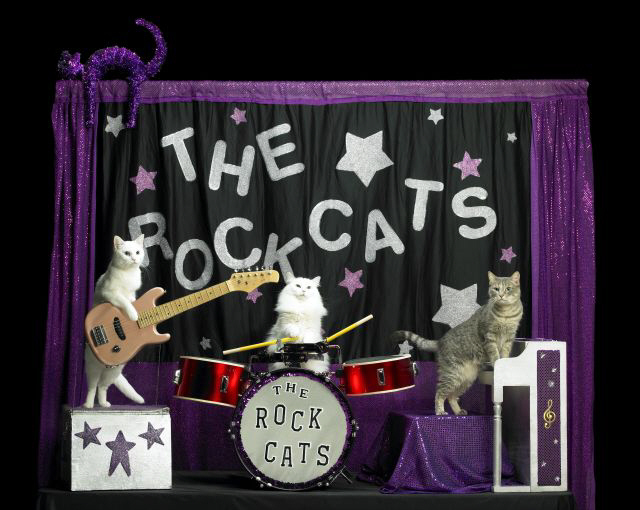 Their musical troupe, the Rock Cats, are members of our MEWSical Society, and you'll see them on the sidebar at the right under Featured Members. This remarkable organization tours all over the U.S. and Canada in their custom-made bus, which has Special Quarters for all the cat performers. Founder, Samantha, finds her performers by adopting Rescue Cats and training them. Among the current Kittens she's trained to ride a skateboard is Buggles, who has just joined our Fan Club. We don't have a Skateboard, and I'm not sure I would be able to Balance on one. But then I couldn't Walk on a Wire, either, as some of the AcroCats do. But I could play in the Band! I've been learning a few of Terzo's percussion instruments, and will have Bobbi take photos soon. Bobbi just wrote something I want to share, although I not sure I actually understand what it means. She said I've learned not just Behaviors, but Concepts. As an example, she mentioned that when she tells me to "touch it with your paw" I will touch whatever is in front of me, not just a treat, but a pen or a toy. And when she says "the other paw" I give her my other paw, regardless of which one I offered first. I guess this means I'm Pretty Smart! I hope if you read this blog, you also check the Cat Facts page as well as the other links on this page. We just added another wild turkey to the Fan Club, and expect other new members soon! My friend, Lily Fry, has a large collection of Stuffed Toys, and Patricia brings her new ones every time she returns from a trip. We have lots of Stuffed Toys in this house, too, and Bobbi tells me it was Tiki (Simon Teakettle II) who loved to play with them. Evidently, Tiki was particular fond of a Little Bear, which he carried around from place to place. This was such an Important Toy that Bobbi put it on the shelf in the office beside the box containing Tiki's ashes, and wouldn't let Terzo play with it. Me, either! 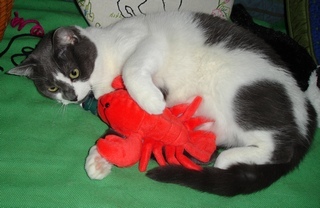 Here I am, with my lobster, one of the few Stuffed Toys I like to cuddle with. I do sometimes sleep with my Tiny Teddy, which you can see on My Page. 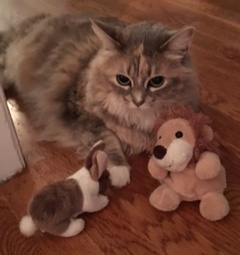 Lily, with a few of her favorites. I don't know anything about computers, because Despite What You Might Think, I actually Dictate this blog to Bobbi. She's my Personal Assistant, providing Personal Care, Food, and all the things Every Executive expects to be done for him (or her). I may be just Two Years Old, but I'm the Executive at Simon Teakettle Ink, having inherited the Company from Terzo. You can read about how Simon Teakettle began on His Page. All this means I don't have to Worry about the New Computer, which my pal, Paul, has just Delivered and Configured (whatever that means). Meanwhile, another pal, Darryl McMahon, just sent us four new fans from Ireland. This adds a 35th country to the Fan Club, and means we now have More than 80 species. The Lamb is adorable, and although it's hard to see the Seal, it's Wonderful to add that species. We also added our first yaks this week, thanks to Helen Russo, who snapped a photo of yaks guarding a flock of sheep in Montana. We just added our first chipmunk to the Fan Club, which is surprising, because you'd think such a common animal would be easy to photograph. But they're very quick, and only our pal Steve Pitt was able to capture a picture of one on his lawn. 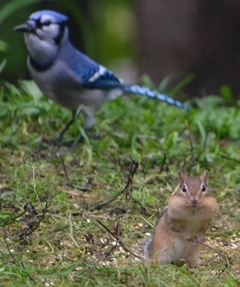 Steve also send us some new bird species who gathered at the many feeders on his lakefront property. We have friends who are traveling this summer to Wales, so will likely add yet another country to the Fan Club. Iris TenHolder, the wonderful artist/photographer who created Terzo's calendars and the MEWSical Society cards, will be in Amsterdam, and hopes to send us another swan from there. Bobbi saw Drum & Marlene Hudson Thursday evening at the Orpheus Angels' Night. They laughed about all the new species they added to the Fan Club from their trip to Australia and New Zealand last winter. The World Capital of Cats seems to be Ciorani, Romania. With the domestic cat population of Ciorani in Romania nearly four times that of the human population, its fair to say that the inhabitants of this small town are cat people. The fathers at the Optina Monastery in Kozelsk, Russia, still practice the ancient rituals of their early 19th-century elders. But one daily prayer ritual at the Eastern Orthodox monastery for men has an unexpected group of devout followers  a band of stray cats. Ten cats live at the monastery, which has shared space with cats since it was first founded in the early 19th century. None of the fathers calls the cats; they just follow the procession all by themselves. The Cat Boat is one of Amsterdams most peculiar attractions. Its essentially a sanctuary for cats, but what makes it special is that the rescued cats all live aboard a quaint little houseboat that bobs along the Herengracht canal. The first dog in our Fan Club was actually an addition to the MEWSical Society. Sadie Katz-Couvrette was a Great Pyranees who Guarded the alpacas and llama who were added to the MEWSical Society as our Camelid Chorus. 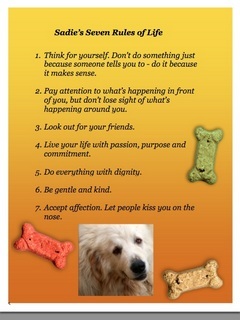 We recently lost Sadie, but she left behind her "rules," which offer a Pretty Good Guideline for everybody. Today is Hug Your Cat Day! June is also Adopt a Shelter Cat Month, so I think we should Celebrate people who adopt Kittens. 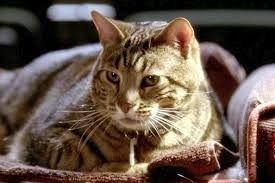 The movie, Keanu, for example, uses Tabby Kittens trained by Larry Payne of Birds and Animals Unlimited. Director Peter Atencio brought his Own Cat, a Gray Tabby named Patrick to the set. Actress Tiffany Haddish took one home (renaming it Catatonic). Payne kept three. This is just One More Example of how Kittens can be Trained. Bobbi started my Lessons as soon as she Brought Me Home. I already knew My Name, and soon learned that I got a Reward if I went to her when she called My Name. Rewards don't have to be Treats. Often, just Praise and Petting will work. I didn't realize until Much Later that Bobbi used Dry Food that's good for me instead of Treats for the first month or so. How Clever! I'm gradually learning all the Tricks Terzo used to do. Watch his Video to see what Terzo was able to Accomplish in six years. Follow My Progress on my Page to see how I'm doing! We haven't added any new species to the Fan Club lately, but have been promised a wire-haired dachshund, which is a breed we'd never heard of before, and we also hear often from current Fan Club members. Milo likes to sleep on this chair. 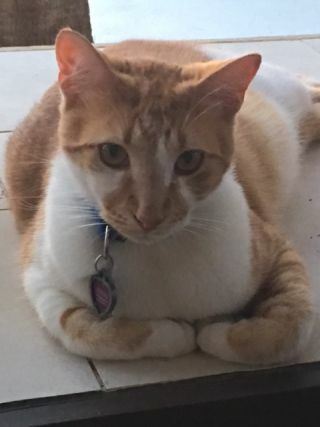 Notice how big his front paws are! He's a Big Boy, like Terzo was. Cuddles and Bailey Russo were members of the original MEWSical Society. There aren't many special days in May devoted to pets, whereas June is Adopt-a-Shelter-Cat-Month. But we think that it's always a Good Time to Adopt a Cat! This is only my Second Spring in this household, and I have only vague Memories of the Great Outdoors. So although I love Watching Birds and Squirrels from windows in the Office, the Guest Room (which has become My Room), the Dining Room and the Bedroom, I'm excited that I'll soon have a Full Screen Door in the Front Hall where I can sit and not only Look Outside, but also Hear and Smell the Outdoors. James has Promised to bring his Big Dog, Carson, over to Visit. It should be Very Interesting with Carson on the Porch and Yours Truly on the Other Side of the Screen. I'll make sure Bobbi posts Photos of that on My Page, along with my Favorite New Activity, which involves the wooden Bedroom Chair. It has Rungs, which have become My Very Own Jungle Gym. It's Friday the 13th, but since the First and Second Simon Teakettles were Black Cats, and that's the company logo, we are clearly Not Superstitious. Not only are Black Cats very Popular, but there are more cats in North American than dogs. The highest ratios of cats to dogs occur in Washington, D.C., the state of Washington, Mississippi, Oregon, and Massachusetts. Seattle is the city with the most cats. The new movie, Keanu, used tabby kittens trained by Larry Payne of Birds and Animals Unlimited. Director Peter Atencio brought His Own Cat, a gray tabby named Patrick, to the set. After the shoot, actress Tiffany Haddish took one home (renaming it Catatonic), and Payne kept three. They had to keep Swapping out the Kittens as they Grew Too Much during the length of the shoot! This weekend is Mother's Day, but Bobbi and I don't like the Idea that Women who have Cats in their lives call themselves "Cat Moms." I love Bobbi dearly, but she's not my Mother! My mother was a cat, and Must Admit I don't even Remember Her. However, we seem to be in the Minority. Most people also don't Agree with us about humans Owning Cats. I stay with Bobbi because I Love Her; she doesn't Owns Me. Cats remain in a Household because they Choose These Humans. It certainly does Help if you Feed us delicious Food, provide Fresh Water, keep Litter Boxes clean, and do Important Things like Clean Ears, Brush us, and even Brush our Teeth. I welcome all these Forms of Attention, and always Watch with Great Interest as she brushes and combs My Fur, because she Saves It in a Little Baggy. A close friend gave her a book, Crafting With Cat Hair, for her Birthday last December. I'm curious to see How That Works! Today is Adopt a Shelter Pet Day. That means a lot to us because Simon II (Tiki), Terzo, and I were all adopted from shelters. Tiki and Terzo were just tiny kittens when Bobbi found them, but I was a year old when I was lucky enough to have her select me to become the Official Spokescat of Simon Teakettle Ink. This is also the first National Tabby Day, which is being celebrated in New York City today with a cat adoption event and book launch of Making the Most of All Nine Lives. This delightful book is narrated by Buffy the Cat, and illustrated by photographer Paul Smulson. Find it on our Favorite Cat Books page. When you adopt a kitten, you can choose any name you wish, but it's not fair to change the name of an older cat. That's how the first Simon Teakettle set the precedent for the company. He was 18 months old when Bobbi adopted him, and since his name was already Simon, she just added Teakettle. That's a reference to the Cervantes quote about the cat calling the kettle black. Coincidentally, Cervantes died on the same day as Shakespeare, whom we celebrated last week. The most common names for male cats are: Oliver, Leo, Charlie, Milo, Max, Jack, George, Simon, Loki and Simba. And for females they are: Luna, Chloe, Bella, Lucy, Lily, Sophie, Lola, Zoe, Cleo and Nala. Today is the 400th anniversary of the death of William Shakespeare, and the 452nd anniversary of his Birthday. Bobbi has a strong Connection to Shakespeare, which you can read about HERE. She has also seen all 37 plays in Live Performance, a Feat she completed in 1987. Bobbi is currently Mentoring an Author whose novel, To Pluck a Crow, is about a young Canadian who suspects that some of Shakespeare's plays were Written by a Woman. Chapters alternate between her Search in England, full of Intrigue, Mystery and Romance, and Elizabethan England, during Shakespeare's time. There's also a Facebook page for the book. Our Fan Club has many exotic animals collected from all over the world, but a National Geographic project has even loftier aims. Joel Sartore has captured portraits of more than 5,000 creatures to date, with more to come. Photo Ark is a multiyear National Geographic project to create portraits of the worlds species before they disappear. We're going to add them to the list of charities we support. Speaking of animal charities, AdoptAShelter.com is turning 5 this year. That project is helmed by Chris Ruben, who presented Bobbi with a Special Award (and a check for $1000) for Best Article on Training at the 2001 Cat Writers' Association conference. Have you seen the photos of My Training Accomplishments on My Page? I know how to Sit Nicely, hold a pen Tightly, and give My Paw for a Treat. There are still a lot of things I Don't Understand, such as why all the snow was almost Gone, and the Birds were Coming Back, and then it Snowed Again! The Good Thing is that this brought Many Birds to the Feeder in our Office Window, where I can watch them Up Close from My Shelf. Birds are flocking to Steve Pitt's feeders, too. Steve is the Pal who has sent us so many fascinating Fan Club members from his home on Lake Talon in Rutherglen, Ontario. The latest batch include a female Downy Woodpecker, a group of Starlings, and a Pine Siskin and Purple Finch, who often arrive together, even those they are males from different species. We now have more than a dozen species of birds in the Fan Club. Bobbi keeps collecting information about all kinds of things to put on the Facts pages of this website. I'm not that interested in Inventions, or Food, or History, but I do like to find out about Other Animals. For example, she just added another Tidbit to the section on Crows, who are evidently Very Smart! It seems that Crows (and a few other birds in that family) can recognize Human Faces, and hold Grudges against people who have disturbed their Nests. Did you know that Jays, Ravens and Crows are part of the same species? Wild pigs and Wild Boars are also the same species, and Swans are related to Geese and Ducks. We have 80 species from 33 countries on Six Continents in our Fan Club! A member of our MEWSical Society sent us a Cute Story about a bunny. 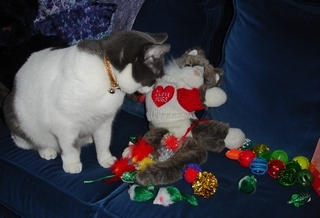 Smokey Munger, who has just joined the Fan Club, had an encounter with a bunny when he was just a tiny kitten. A grey and white who looks as if he could be my brother, Smokey is the model for Rags in Patricia Fry's mystery series. Patricia's mother saw Smokey tearing around the yard, chasing a baby rabbit. There was no way she could stop either one, and the tiny bunny's fate seemed sealed. But when she looked out again, she saw Smokey stretched out on the grass panting. 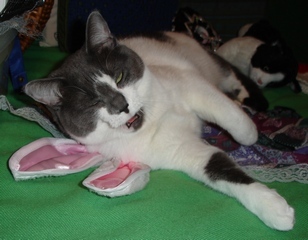 The bunny had flat worn him out and she was able to bring Smokey inside. So cats are fast, but even Baby Bunnies can sometimes outwit us. I wouldn't know. I don't Go Outside, and my only Encounter with a Bunny has been the ears Bobbi tried to entice me to wear. See that encounter on My Page. Here I am, inspecting the ears, and then yawning because Bunnies are Boring. Nobody seems to notice The Ides of March anymore, but two of Bobbi's former Latin School students celebrate it every year. It was Susan Haskins, creator and co-host of Theatre Talk, who began to call it Ubble Day, and the name has stuck for 50 years! We're quickly approached the First Day of Spring, and I'm already waiting for Bobbi to open the Front Door so I can get a bigger view of the front yard. Meanwhile, it's fun to sit in the Office Window to watch Birds coming to the Feeder as the snow gradually melts. I'm sure you realize that most of what I write about I've learned by watching TV with Bobbi. She reads a lot, but I prefer to hear rather than try to wrestle with paper. 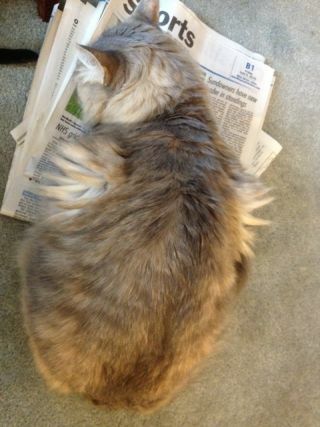 In fact, sometimes I try to climb on the newspaper when she opens it on her lap. I understand a lot of things, but there are some which are Puzzling. For example, why is Bobbi changing all the clocks and timers this weekend? This strikes me as Very Stupid. The days are getting longer anyway, and I pay little attention to Clocks. In fact, if Bobbi wants to sleep longer in the morning, I either stay on the bed until she gets up, or jump down and go into the office to look out the Window. People also have Holidays I don't understand. Any day that celebrates Cats or other Animals makes perfect sense, but what is Easter? And what do Bunnies have to do with it? This is the subject of my latest message and set of photos on My Page. My birthday was a month ago, but today's mail brought my First Actual Card, which came from a Friend & Admirer in Edmonton, Alberta. All three Simon Teakettles received cards and gifts in the mail over the years, so I plan to save the envelope, as Proof Positive that the card was addressed Just to Me. It should be noted that it's Never Too Late to send a card or a present to me. Cats don't pay attention to Calendars. Although I did notice that March 3rd was If Pets Had Thumbs Day. Who comes up with these ideas? What we're celebrating this week is the addition of a raven to the Fan Club. We checked, and ravens and crows are different species. In addition, this particular raven has no tail feathers. This brings us to 70 species! This is a Leap Year, which, I was disappointed to discover, has nothing to do with how cats leap into the air to catch a toy. I often catch things in my paws mid-air, but so far Bobbi hasn't been able to catch me in action to take a photo. There are some new photos on my page, however. We're very excited about the March production at one of our favorite theatres. Great Canadian Theatre Company is producing the award-winning Butcher, in which our own MEWSical Society theatre advisor, John Koesngen, speaks an invented language, and shares the stage with his accomplished son, Jonathan. 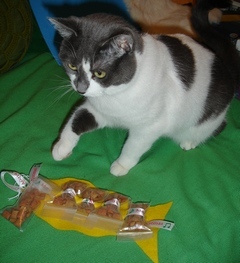 We received an adorable cat Valentine from cousins who live in Troy, NY. 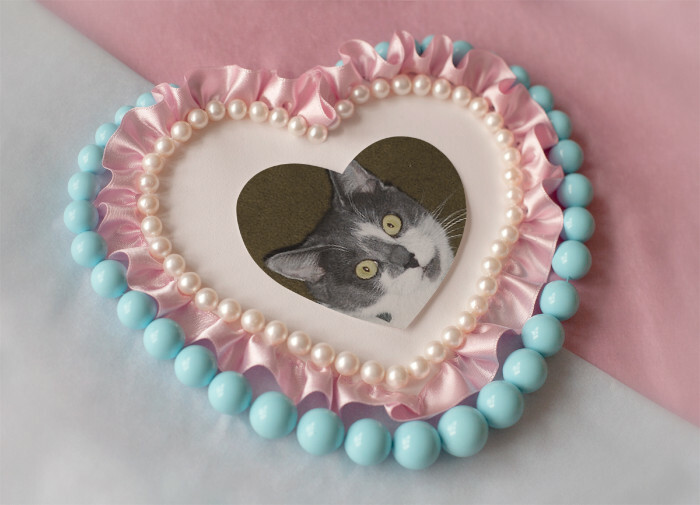 It's the PURRfect way to celebrate Love Your Pet Day, which happens to be today. Because we love all pets, we watched the end of the 2016 dog show, where a German short-haired pointer was awarded Best in Show. His name is C.J., and his best pal is a cat called Tootsie. We've added C.J. to our list of celebrities who have cats. Tomorrow is Valentine's Day! I give Bobbi lots of Kitty Love every day, and she rubs my Ears whenever I climb on her lap, and my Tummy when I flop on the floor in front of her. I like to be petted and brushed, but having my Ears and Tummy rubbed are my Very Favorite forms of Affection. but I don't hug her much. We do sleep together sometimes, however. There's a Big Bag of toys waiting for me to play with on Friday when the kids come over. Bobbi said she'll take pictures and post them here and on my page over the weekend. Less than a week to wait for my Birthday! Bobbi told me she's going to invite the children across the street to come over Friday after school to help me celebrate. about the Tasmanian devil! I had Bobbi put him on the far right of the page, so he doesn't scare too many visitors! 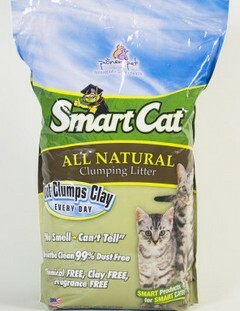 This is National Answer Your Cat's Question Day. Rather than asking who invents These Days, which would waste my One Question, I want to know Why I Can't Have My Favorite Canned Food in my Dish more than twice a day. That's a perfectly reasonable Question, don't you think? January 24 is Change a Pet's Life Day. I won't actually celebrate that until Feb. 4, which is the day Bobbi found me at the Aylmer SPCA. That's just one day after my birthday. I was born in 2014, so I'll be Turning Two in just a few weeks. I overheard Bobbi telling a friend that it's a Good Thing that cats don't go through The Terrible Twos. I happened to see Bobbi sneak a bag into the house last week which looked like it held New Toys. Could that be a Birthday Present? This is Annual Walk Your Pet month. Whoever came up with that idea obviously never experienced January in this part of Canada. We've had two frostbite advisories in the past two weeks, meaning that even taking a dog out for a quick walk is dangerous to vulnerable paws. This doesn't apply to me in any case. I don't walk anywhere. I either Run (from window to window to see if the squirrel in the back has moved to the front) or flop down in front of Bobbi when she goes from room to room, asking her to Rub my Belly. Check out my page to see many of these activities. Bobbi tells me that since I'll be two years old in less than a month, I have to make New Year's Resolutions. Another Resolution Bobbi should make is to allow me to see what's behind The Mysterious Kitchen Door. Every day or so she Disappears behind that Door, sometimes to go somewhere in the House where I'm not Allowed, but sometimes to go Out! If she returns with some Cans of Fancy Feast or Friskies, I guess this is okay, but I have no idea where else she might want to go. This was the Face I made at that suggestion. 1. Treat time should be more than twice a day, and more than just two tiny treats! 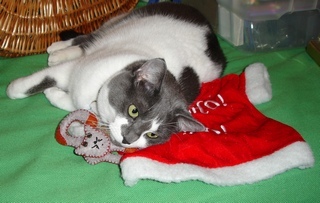 My friend June gave me a wonderful Christmas present of a felt fish with little bags of treats attached by a ribbon. I should be allowed to have all of those in One Day! Wow, a new blog of My Very Own. When I arrived in this household in February of last year, I took over Terzo's blog. But as I approach my Second Birthday and have proven to be a Very Good Girl, I've been rewarded with a blog of my own. I'm leaving the last dozen or so posts from last year below this one, but we've changed some of the Featured Members of the MEWSical Society, and moved some our Affiliates and organizations we support higher on the page. Did you know we have our own Facebook page? Take a look and become one of our followers. This is our last post for 2015, and means that I get a fresh new blog of My Very Own for 2016. I'm celebrating this week because we added the 32nd country and 60th species to the Fan Club, with a wild boar from Sri Lanka. 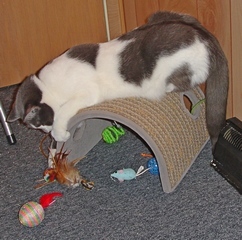 I'm a bit overwhelmed by all the new toys I received for Christmas. Some of them came from Bobbi, but there was also a Very Big Stocking from Juliana Najak and Matthew Ramar, as well as a couple of great gifts from June Coxon. See the photos on my page. Now you'll have to Excuse Me, because I have some balls to chase! The first cat cafe in Vancouver, B.C., has just opened. It's called Catfe. We have a cat from one of the first cat cafes, in Singapore, on our Fan Club page, along with seven Siberian cats who live at the delightful cafe in Chelsea, Quebec. We've just added our first Russian Blue to the Fan Club. "Blue" is the color the cat fancy calls what appears to be grey. So I'm not grey and white, but rather, in "fancy" terms, blue and cream. We're all ready for Christmas, a new experience for me, because last year at this time I was in a cage at the Aylmer SPCA! Can't wait to see what's in these things Bobbi calls "stockings," and to find out what else she has in store. This is the 150th anniversary of Alice in Wonderland. The beloved classic has been turned into many movies and a few stage productions, including the Virtual Production of Simon Teakettle's MEWSical Society. See the cast HERE. The Rock Cats, who belong to the Society, actually perform live, traveling by bus all over North America. As you can see, we're getting ready for Christmas. Do check out the Christmas facts on our Facts page. We have exciting news about the Fan Club. Thanks to Simon and James Quesnel, we've added Barbados to our list of countries, and five more species, including the rare Patagonian Mara, who is rarely found outside Argentina. That brings us to an astounding 59 species from 31 countries on six continents! The Quesnel boys (and their sisters) already have two pets in the Fan Club. Bungie was our first rabbit, and Carson is a golden retriever they added to the household in the fall. Americans celebrated Thanksgiving this week, which leads me to write about one of my favorite subjects: FOOD. I think I've mentioned before that Bobbi won't give me Fancy Feast or canned Friskies unless I sit beside my tray in the kitchen. No amount of ankle-rubbing and meowing persuade her to relent. 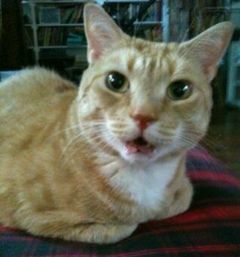 One of our MEWSical Society members, Toffous (an orange male) is a great communicator. 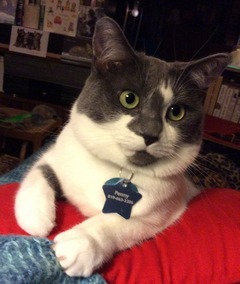 He lives with Pookie and their human, crossword puzzle creator Kathleen Hamilton, in Montreal, and Kathleen said he's been "talking" since he was a tiny kitten. He and Pookie have separate bowls, and one day, when he realized he was eating from the wrong bowl, he made a sound like "Oh!" 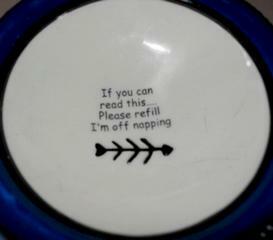 and moved to the other bowl. The Morris Animal Foundation funds studies to help prevent and treat cancer, which is the top killer of pet cats and dogs. We support them in memory of Terzo. Click on the The Animal Rescue Site to give food to an animal in a shelter.